When playing table tennis at home, the amount of room you have around your ping-pong table can influence whether you have fun or end up frustrated. Unless you have the luxury of designing your own ping-pong room, you'll probably have to make the best of your existing game room or garage. Do you have enough space for a table? 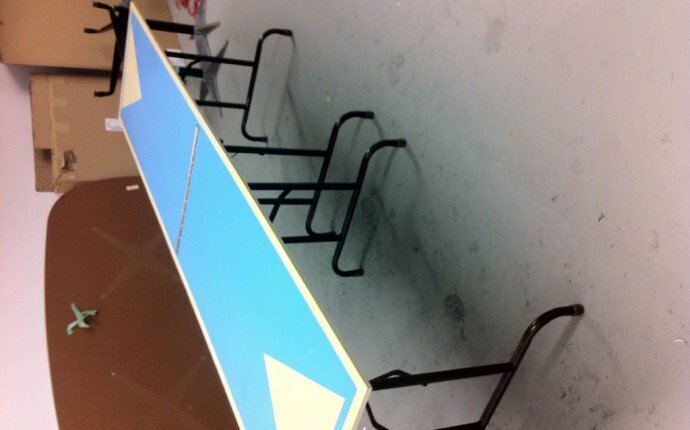 What are the standard ping-pong table dimensions so you can be sure it will fit. Ping-Pong Table Dimensions: What Works? A full sized table tennis table is 9 feet long by 5 feet wide, so you will need a little more than that amount of space or you'll be sitting on the table to play! Seriously though, for a fun family game of singles ping-pong, assuming the players are relative beginners, you can probably get away with 5 feet to 6.5 feet behind each ​endline, and maybe 3.3 feet to each side. Maybe even a tad less if you don't mind leaning on furniture or hitting your bat against the wall every now and again. But you want to have enough space to make your purchase worth it. If you are going to play a lot of family doubles, add another 3.3 feet at each endline and 1.64 feet on each sideline, just to give you room to get around your partner. Otherwise, you'll probably have to play tennis doubles, where each player can protect his own side and hit the ball out of turn. If you are using a robot to train, things are different. You'll need less room at the robot end, as you only need just enough to squeeze the robot up against the wall. This gives you a more room on your side of the table, which is good. From there, it once again depends on your standard, not to mention your style of play. Beginners will probably need less space than advanced players, and close-to-the-table hitters and blockers will need less room than choppers and loopers. You're probably looking at 6.5 feet depth for beginners, and for advanced defenders and loopers should have 13 feet to 16.4 feet of depth. In terms of width, you can get away with a smaller area if you are willing to go to the trouble of moving the robot and table to allow you more space on the forehand or backhand. Of course, this won't help if you are doing a drill involving both sides of the table. Give yourself 1.3 feet to 2.6 feet of extra space if you want to really work your crossover footwork, but you could get away with only about 8.2 feet provided you don't do any side to side drills. When the feeder stands behind the endline, this is pretty similar to the robot training space requirements (perhaps a touch more), because the feeder doesn't need all that much space. When the feeder stands next to the sideline, you will actually have even more space available for the trainee in terms of distance from the endline, because you can push the table just about right up against the wall. You also need a little room on the sideline the feeder is standing on for him to be able to swing his racket when feeding balls. How much room do you need for ping-pong table dimensions and your home ping-pong game room if you're an advanced player? 3.02.03.01 The playing space shall be rectangular and not less than 46 feet long, 23 feet wide and 16.4 feet high, but the four corners may be covered by surrounds of not more than 4.9 feet length. Many national-level events tend to use court sizes of 39.4-feet long by 16.4-feet wide. So if you are lucky enough to be anywhere near that size you are probably going to be in fairly good shape. If your area is much smaller than 32.8 feet by 13.1 feet, you are probably going to be bouncing off the walls a lot, and you should probably consider doing more multiball training to simulate match conditions.